Our consumers show us time and again that ‘disability’ is merely a term, and not one that limits them from achieving their full potential. Here, we highlight two very special young women who receive services from BCL and also work for us in our main office. 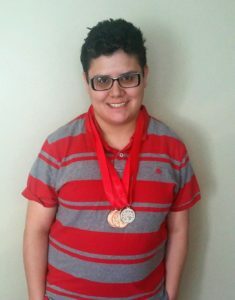 Both of them received medals at the Special Olympics this year, in addition to their many other talents and accomplishments. Meet Ashley, 25 years old, driven, enthusiastic, and one of the most caring young ladies you’ll meet at BCL. Recognize her? It’s because she’s the friendly face greeting people at the 5 Ventura Drive front desk. Ashley, who lives in Dartmouth, is full of energy and life. When she’s not enjoying her work at BCL, or at her second job over at Anytime Fitness, she loves going out with her staff, hitting up the beach, and listening to music. Her favorite? Rap! Ashley’s lucky too. She enjoys every chance she has to visit her family in East Wareham. “I like to visit my parents as they’re getting a little bit older,” she says. 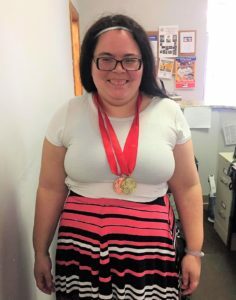 “I never thought I’d do the Special Olympics,” Ashley says, “but I put myself to a challenge and I got two bronze medals. One was for the javelin throw and one for the shotput throw.” Not only did Ashley love competing, she loved the entire experience. Staying with her staff chaperone, Aisha, Ashley says, “She helped me and supported me through everything, through the whole thing… and she cheered me on when I was throwing.” Ashley also enjoyed seeing a couple of her friends from other local agencies. Ashley describes herself as this. “I push myself beyond limits. That’s what I do. Until then, however, Ashley enjoys her life and loves the opportunity she’s been given to work for BCL. “I care for a lot of people at BCL. It’s been good. I’ve been able to get along with everybody here. I’ve been here for three years and absolutely love it. When I earn my money, I spend it wisely. I don’t spend on foolish things. I save up for things I want,” she says. Meet Sarah, 31 years old, dedicated, responsible, soft-spoken, genuine, warm, loving, happy… Her list of amazing qualities goes on! Sarah has worked for two years over at the front desk of BCL’s 5 Ventura Drive office. When asked what her work is like, she responds, “I just love it.” It’s clear Sarah is very good at her job. She manages numerous tasks all at once, from answering phone calls to letting in visitors, filing papers, and assisting the staff with their various projects. She even helps with the Human Rights Trainings with Marina. “I help her with the training for the staff… I just love it,” Sarah remarks. However, what stands out most is her ear-to-ear smile that lights up the room when anyone walks in. A visitor, coming back on a return visit to BCL, was immediately recognized by Sarah who said, “Oh! You’re back!,” to which she quickly made small talk with him. When Sarah isn’t working at BCL, or training to win Gold medals, she lives in New Bedford with a roommate. “She’s very nice and friendly,” Sarah says, “I’ve been there just about a year.” She also has another job over at Anytime Fitness. “I clean. I love it. People are friendly. The lady I work for, Michaela, is so friendly,” Sarah says. In her spare time, Sarah loves shopping and “just getting out,” as she puts it. She also loves listening to music, noting that NSYNC is what’s playing on her Pandora right now. Oh, and she also likes history. “I went to King Richard’s Faire with my roommate, and my manager and my staff. I loved it,” she says. When asking Sarah to describe herself, the answer is no surprise after talking with her. “I’m a friendly person,” she says. “It’s just a natural quality.” Sarah hugs friends, even brand new ones, who visit BCL and greets everyone with a smile. Her joy, enthusiasm, and commitment to her goals is inspiring, and she can’t thank BCL enough for all its support. If you loved this story, consider a donation to our agency. It’s people like YOU that help make these stories come true. Make a secure donation online HERE.